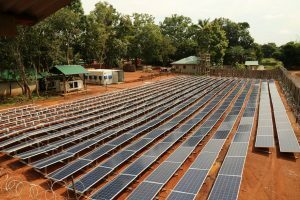 Community microgrids increasingly appear to be more cost-effective than extending the central grid in the developing world, according to new findings by Bloomberg NEF. 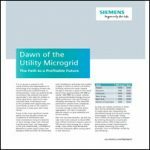 With an improved price position, microgrids will serve 34 million of the 238 million households that will be electrified between now and 2030. Another 72 million will install home solar systems, according to Itamar Orlandi, head of frontier power research for Bloomberg NEF. Orlandi pegs community microgrid costs at $0.29-0.77/kWh for frontier regions, based on market data on components collected in late 2017. He compares this to the $1/kWh many households must pay to connect to a centralized grid. In all, extending the grid to a remote household can cost $266-2,100, a daunting cost in regions where people live on less than $5.5 per day. He sees East and West Africa and Southeast Asia as the primary markets, with basic solar-storage-diesel systems as the dominant technologies for community microgrids. “You might occasionally see other sources such as biomass or small hydro, but generally we’ve seen most developers focus on solar-centered microgrids. These require less local adjustments and may therefore be easier to build quickly as part of a larger portfolio,” Orlandi said. 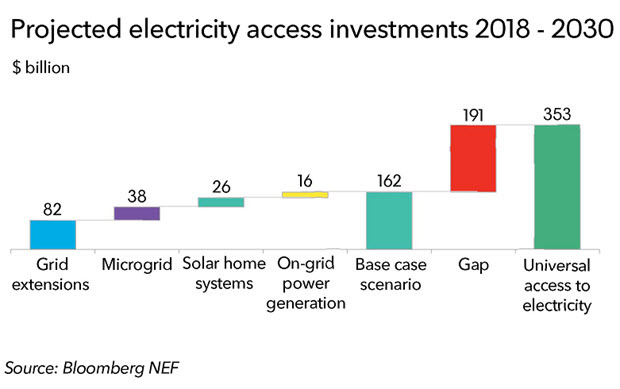 Bloomberg NEF expects about $38 million to be invested in microgrids for energy access from 2018 to 2030. Large energy companies are moving into the regions to build both microgrids and solar, among them Engie, Enel and Shell. Bloomberg NEF also cites startups like PowerGen, Electric Vine Industries and Husk Power for their work on community microgrids, often through pre-pay models. Opportunity exists to not only electrify remote households, but also connect them to the Internet in partnership with connectivity companies. Four billion people lack Internet access, according to Powering Last Mile Connectivity, a report by Bloomberg NEF and Facebook. “The start-ups that have garnered a lot of interest have three things in common: they leverage data connectivity, focus on deployment and retail distribution, and turn energy into a product rather than a service,” he said. Orlandi sees value, for example, in partnerships between microgrid companies and the agriculture or health industries. “Running a microgrid that serves mostly day-time power demand, for instance from water pumping or cold storage, can reduce the average cost of power to the village by 18 percent,” he said. Several multinational energy companies, primarily from Europe, are already partnering with startups on such projects. “Increasingly these efforts come from their business rather than philanthropic units,” he said. Still, it will not be easy to electrify the full 14 percent of the world’s population that remains without power. In fact, Orlandi expects 365 million people to still have no electricity by 2030, despite the addition of 238 million microgrids and home solar systems. Supply constraints and lack of financing hinder progress, he said. “Rural electrification is typically provided through government or utility-led programs. Historically, in many places, these have been slow,” he said. Track news about community microgrids. Subscribe to the free Microgrid Knowledge newsletter. I fail to understand why microgrids are viewed only for the “developing world” or for rural un-electrified communities. Microgrids can and should be competition for urban electrified regions too – malls, buildings, factories, …. local generation, local consumption. The economic benefits overall will help the economics for un-electrified regions too. 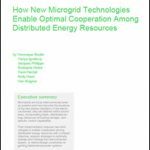 As I said in my book: “The topology of the grid of the future is a federation of microgrids” – everywhere!